Modes. Last month, we took a look at the most popular new digital mode, PSK31. So this month, I thought it worthwhile to look at the old digital mode, RTTY (pronounced “ritty”), which is short for “radio teletype”. It does not have error correction or a backspace, or even lower-case characters, all of which PSK31 enjoys. Some have suggested that RTTY will die because of advancements like PSK31 and other digital modes, but although that may be the case some day, RTTY is very much alive and well, and will be for the foreseeable future. Hams, if nothing else, hang on to their history quite well. I’m not going to focus on the theory of it or even the history of it (it’s been around since 1953), but will instead discuss the practical implementation in your shack. Theory and history can be found at some of the links I’ve listed at the end of the article. You’ll need an HF rig with SSB or RTTY capability, a computer with RTTY software, and a sound card interface or TNC device. The interface is what sits between the rig and the computer. Note that different interfaces will do RTTY differently. There are two ways to transmit and receive RTTY: 1) AFSK, or audio frequency shift keying, is done in LSB mode, and 2) FSK, or frequency shift keying, is done in RTTY mode. Either works fine. What are they? If your rig doesn’t have a RTTY mode, or in the interface doesn’t support FSK RTTY, then you’ll need to do AFSK RTTY. The main disadvantage is that you won’t be able to take advantage of nice RTTY filtering (on receive) that some radios have. For AFSK, you’ll generally use LSB on all HF bands, but that really depends on your software. If you get the LSB/USB selection mixed up, you’ll be “reversed” and uncopyable. With AFSK, your RTTY signal will go out like voice audio, except that it will be RTTY tones. 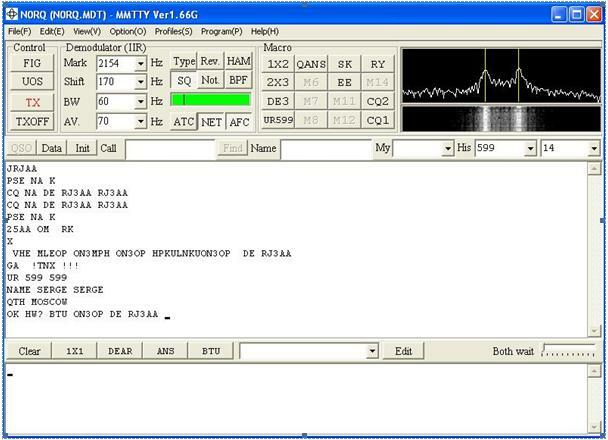 You’ll also need RTTY software, and you’ll be glad to know that it is free and there are several options, though the most popular one is called MMTTY. There are others you can try as well. It is not usually a low-power mode like PSK31. Most guys run a full 100w, if not more. Make sure you can decode a good RTTY signal before you start to transmit. Look for signals where RTTY is used – see the frequency list below. Here is a screen shot of MMTTY. In the upper-right corner is the signal received (both spectral and waterfall). You’ll see two peaks, which are the “mark” and the “space”. The two thin vertical yellow lines are there to help you tune in the signal – the mark and the space should line up with those lines. There are lots of buttons to play with, including macros which are often used as shortcuts to typing common stuff over and over again. The green bar is the strength of the signal received. The big window with text in it is the received text window. In this case, it shows RJ3AA calling CQ NA (North America), with ON3OP answering him (maybe he missed the “NA” part), and the Russian graciously answering him. At my station, the RJ3 was very strong and the ON3 was quite weak (on 20m). The smaller white box at the bottom is the typing area for what is going to be transmitted. Yes, you can type in advance while receiving, so that when the other guy is done, you’ve done some of the typing ahead. The TX and TXOFF buttons flip between XMIT and RCV. There are lots of options to set up in MMTTY, and it can be tricky. The best advice is to read the AA5AU link below for detailed instructions. The common frequencies (in MHz) are shown below. Again, your rig must be in RTTY (FSK) or LSB (AFSK) mode! The “calling” frequency is generally the lowest freq in the range or just above it (i.e. 14.080); in other words, most RTTY activity is in the lower portion of the ranges given above. There is more RTTY activity on 20m than on any other band, so 14.080 to .085 is a good place to start. NOTE: if you’re running AFSK (LSB), start 2.13 kHz below these listed frequencies, because the “dial” freq is off by that amount. If you’re chasing a rare DX station, he may operate “split”, usually listening 1 to 5 kHz up. Just use your rig’s split freq (or VFO A/B) to transmit where he is listening. He’ll say what he is doing by transmitting something like “UP 2-4”. One way to make a bunch of quickie contacts, after you’re set up and working, is to jump in the RTTY contests. Links for contest info are shown below.